Another Hacking group after Lulzsec, comes with name LulzsecReborn has posted names, usernames, passwords, and emails of 170,937 accounts on MilitarySingles.com on Pastebin as part of the group’s Operation Digiturk. 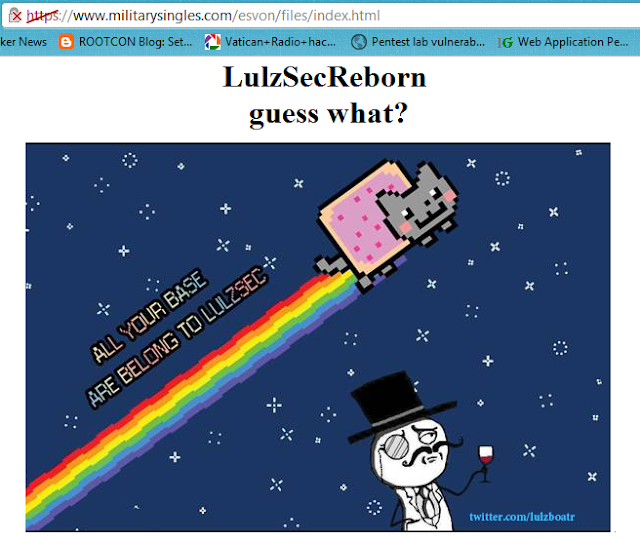 LulzSec was a major ticket item last year as the group hacked a number of high profile Web sites all in the name of the “lulz.” After their so called “50 Day Cruise,” the group broke up and went their separate ways.Hacker claim that, There are emails such as @us.army.mil ; @carney.navy.mil ; @greatlakes.cnet.navy.mil ; @microsoft.com ; etc.. in dump. In a video posted to YouTube last weekend and titled LulzSec Returns, the group says it decided to "bring back our humble hacking group and set sail towards the interwebs again". Referring to the arrests, it said these had "merely disrupted the active faction". Lulz Security, the group of hackers that had attacked several government and corporate sites before disbanding last year, hinted at a comeback on April 1.